Today’s post covers Hua Hin as an alternate place to visit for a golfing holiday. The smaller city of Hua Hin is located on the opposite side of the Gulf of Thailand, and is approximately a three-hour drive from Bangkok. This city has become a bit of a golfing ‘mecca’ in Thailand, and is extremely popular with couples and families due to the much quieter atmosphere than Pattaya. As you can also see in this photo, the Hua Hin beach is also cleaner and more tranquil than Pattaya. 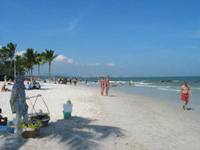 The vast stretches of white sand are a big contrats from the busy beachfront of Pattaya. Read all about Hua Hin in the continuation of this post. Hua Hin was Thailand’s original beach resort, and his home to the King’s summer palace. Because of this, it retains a degree of tranquility, although the city is also developing rapidly to cope with the increasing number of tourists, but not as commercially as other resorts. The choice of golf in Hua Hin is not as expansive as Pattaya, but it does host 6 very challenging and well designed golf courses in close proximity. Two of these courses, Springfield and Imperial Lakeview, will shortly open a further 18 holes, and together with 2 other new championship courses to open late in 2006, there will then be a much greater choice for visitors. It still retains the intimacy of a fishing village, and with its own local fleet, visitors can stroll down to the harbor to enjoy the fresh seafood available in many of the fine waterfront restaurants. Like all resorts, it also provide a wide range of both local and international cuisine. There are many small local boutique shops in Hua Hin, and also it’s famous night market, selling the local crafts, paintings, silver and silks of the region, all available at bargain prices, ensuring maximum opportunity for shopping..
Hua Hin is an ideal destination for those looking for a quieter, more relaxing holiday, looking to combine their golf with relaxing evenings in the more tranquil atmosphere that the town offers.